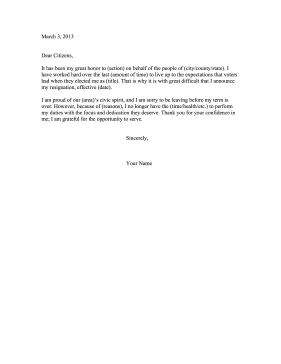 This customizable resignation letter should be publicly delivered from a governmental or political party member to the members of the community. It has been my great honor to (action) on behalf of the people of (city/county/state). I have worked hard over the last (amount of time) to live up to the expectations that voters had when they elected me as (title). That is why it is with great difficult that I announce my resignation, effective (date). I am proud of our (area)'s civic spirit, and I am sorry to be leaving before my term is over. However, because of (reasons), I no longer have the (time/health/etc.) to perform my duties with the focus and dedication they deserve. Thank you for your confidence in me; I am grateful for the opportunity to serve.